For the first time I did a real session photo in my studio. Omg so fluffy and cuuuuuuuuute!!!!! My girlfriend & I have 3 Ferrets; Beesley(Albino) , Bonnie(Sable) & Fuki(ChampangePoint) and the lil'fuzzy are the best ,love em'!! ...we liike you photos of the lil' darlings. You're welcome! Who could resist that adorable picture?! I used this picture here, if you have any problems just let me know and I will replace the image. Yes I normally do. I was having so much fun making it. I think it looks brilliant. I have linked back to your account. great photo and expression, so cute! She is such a beautiful ferret!!!!!!!!!! Just a stunner, you got a good one! Tu as su capter à la perfection son petit air attendrissant ... elle donne l'impression de savoir s'y prendre et d'aimer jouer la starlette. 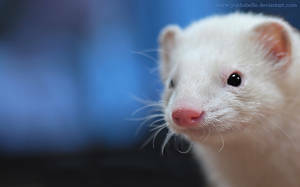 Your ferrets are so stunning! And I love the expession. its a ferret! so cute!